To get maximum trouble free and fade free performance from your new brake pads or new pads and rotors it’s necessary to break them in properly. This process is often called “bedding in” or burnishing, which is the process of gradually warming up your brakes through repeated brake applications to transfer pad material to the rotor for a nice smooth working surface. We’ll describe the bedding in process later in the article. Please note that the average week end play rider may never apply enough loading to the brakes to experience fading due to improper bedding in. But if you do ride aggressively and want the most out of your brakes, it’s well worth the 15-20 minutes it takes to properly bed them in. Most modern full size off road bikes come equipped with good quality sintered metal pads, which require bedding in for maximum safe performance. Smaller play bikes may have organic pads, which bed in pretty quickly just from normal riding, but usually aren’t found on larger off road bikes as they are not up to the task of repeatedly stopping a 400 lb dirt bike and rider at high speeds. If you are running an organic compound, it is still important to properly bed them in to avoid a condition called “Green Fade”. Why You Need to Bed in Your Brakes…..
Now that the pad and rotor contact area has been optimized, the second function of bedding in occurs during the remaining 5-10 brake applications, which will generate much more heat to cause the compound binding chemicals (organic pads only) to be burned off. During this process, you will smell the hot brakes and may even see some smoke come off the pads. This is normal and a very important part of the process. If this process is not completed properly, you can experience a condition called “Green Fade”. Green fade occurs when pads that have not properly been bedded in, rapidly reach high temps that causes the pad binding chemicals to off gas. The off gassing creates a liquid state between the pad and rotor and results in greatly reduced braking power and in some cases glazing of the pad. Gradually bringing the brakes up to maximum operating temp in the last 5-10 brake applications of the bedding in process allows the gasses to be burned off without glazing or complete fade. 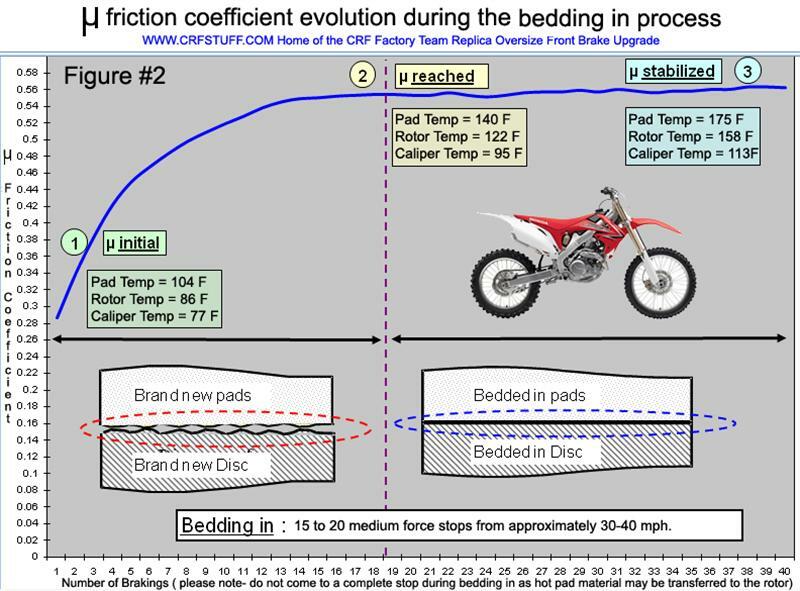 The basic process of bedding in pads and rotors is to accelerate your bike up to 40-50 mph (about half throttle in 4th or 5th gear) and bring the bike down to about 5 mph by applying the brakes at about 60-80% stopping power. Cruise back to your starting point to allow some cool down time between braking runs. Do this about 10-15 times and gradually work your way up to applying maximum braking force without locking up the tires or coming to a complete stop. It’s important that you do not bring the bike to a complete stop using the brakes during the bedding in process. If the bike comes to a complete stop with extremely hot brakes, it’s possible to transfer a large amount of pad material to the rotor in a small spot, resulting in uneven transfer thickness on the rotor. This can lead to pulsing and inconsistent brake performance due to the changes in friction coefficient. (if this happens, you’ll be able ot see a dark discoloration in the shape of the brake pad on the rotor) Left unchecked, hot spots can develop that will permanently damage the rotor. If you catch it early, you may be able to remove the excess pad material by dressing the rotor with medium grit sandpaper (800-1000 grit) followed by a thorough application of Bra-Kleen. Keep in mind that the proper amount of pad material that is transferred to the rotor is very small, approximately .002-.004” and you can’t really see it, other than a slight grayish discoloration. What’s important is that the discoloration is consistent on the rotor surface. Read through the information above to make sure you understand the bedding in process and then make plans to properly bed in your brakes. Plan to spend about 15 to 20 minutes and make sure you have a safe place to do it. You’ll need a large area where you can safely and repeatedly accelerate up to 40-50 mph and then stop quickly. Make sure you have plenty of run out room in case you induce severe brake fade or boil the brake fluid and lose your brakes. That shouldn’t happen if you follow our instructions, but you should still be prepared for it just in case. 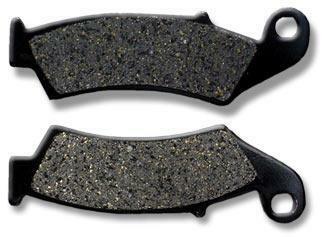 Immediately after completing your brake pad installation, work the brake levers a few times to rebuild system pressure. Failure to do so could prove disastrous. It’s not uncommon for it to take a good 4-5 lever pumps to bring back hydraulic pressure in the system. If you are flying down the street or back alley of your neighborhood, probably w/o a helmet or riding gear, ( hey we’ve all done it!) and go to test out your newly installed binders only to find you got nuthin, your instincts are not going to be pump the brakes, it’s more like freeze up solid and panic! Avoid this by putting a piece of masking tape on your throttle grip or something to remind you. 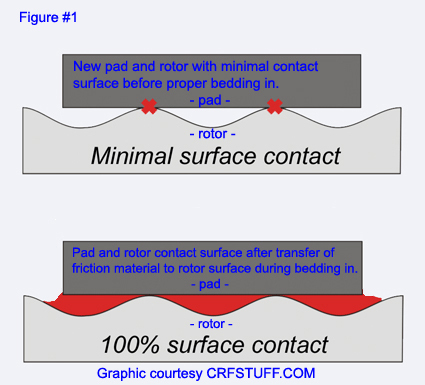 If you are changing pad compounds and using your old rotor, it’s best to clean up the swept area of the rotor to remove the old pad compound to prevent any compound compatibility issues that might prevent the new pads from bedding in properly. Use 800-1000 grit sandpaper followed by a thorough application of Bra-Kleen. Don’t forget to grease caliper sliding pins according to the instructions in your owners manual. If they get dry, they will allow the caliper to bind, resulting in uneven clamping force, which leads to poor braking power and potentially overheating the brakes, leading to brake fade. Brake power is generated by the friction material on the pads transferring and bonding to the surface of the rotor. In order for this to occur, the friction material must first be transferred onto the surface of the rotor. This generally happens during the first 10 – 20 stops of a brake system and is referred to as “burnishing” the rotor and pads. When a rotor is cleaned, it will need to be re-burnished again. µ - pronounced “mew” A numerical indicator of the “grip” of a material used in brake pads. Coefficient of friction varies depending on the type of pad material used and for the brake rotor alloy. Friction Material Fade When pads reach high temperatures they can sometime “outgas” chemicals that redeposit themselves on the surface of the brake pad. This decreases the coefficient of friction and results in a decrease of brake power. The lever will remain firm however the brake will not generate the normal amount of power. This is also described as when pads “glaze” over. Generally the result of improper bedding in / burnishing. Brake Fluid Fade This type of fade occurs when the brake fluid inside the caliper boils. Brake fluid is incompressible; however, if it is allowed to boil from overheating, a gas is formed within the system that is compressible and pressure applied to the lever goes toward compressing the gas instead of generating brake power. Water in the fluid (even in microscopic amounts) dramatically lowers the boiling point of brake fluid allowing the brakes to fade even under light loading. Controlling brake power without wheel lock up. Modulation is best with a brake system that has a “firm” brake lever, i.e. no air in the brake fluid and no flexing rubber hoses. Minimal lever stroke required to generate maximum brake power. A soft brake lever is generally more difficult to modulate and control. Cellulose Fibers and organic materials bonded together with a resin. Not well suited to wet, sandy or muddy conditions. Poor heat transfer, can cause rotor overheating with continued abuse. Soft material provides good easy modulation for beginner riders, but also contributes to rapid wear. Manufactured using a process that molds a carbon fiber matrix compound under pressure at 1800 F for 600-800 hours to produce a very light high density pad that has excellent friction properties combined with a very high resistance to heat induced fade. Also excellent in wet conditions. Highest friction compound available for off road motorcycles. The total friction area contacted by the pads during one revolution of the rotor.